In his book “The Human Province”, Elias Canetti notes how “It is only in exile, that one realizes to what an important degree the world has always been a world of exiles”; it is but with this predicament in mind that one objects to the whole genre of war writing, and raises the question of whether exile, displacement and war had not been there already to begin with. Are not wars and exiles more constants than exceptions? An answer isn’t easy to come by. But as Canetti is careful to note, this realization happens only in exile. Though it is not impossible to find oneself at home in exile – and for some, exile becomes not only a permanent home, but the preferred home, showing how being at home has become a rather vague illusion for the millions of denizens – rather than citizens – of a world made at once bigger and smaller: Infinitely less familiar and more pregnant with possibilities. In the Middle East, exile and displacement – and not necessarily voluntary in most of the cases – is nothing of a literary metaphor or novelty in most of the cases. What is this home, though, to which so many yearn to return to? Was that home so sweet after all? Was it not the scenario of violence and pain? Was it not a tunnel without light at the end? What is the meaning of regret – over what is left behind – when you had no choice? 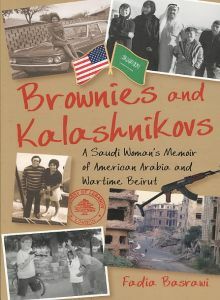 Fadia Basrawi’s memoir “Brownies and Kalashnikovs: A Saudi Woman’s Memoir of American Arabia and Wartime Beirut” (2009) is one of those question marks that ask the reader to enter the perilous zone of liberating oneself from the convention of reading memoirs intensely trapped in a by-gone past, and paradoxically just as intensely focused on the future. A tale of love and darkness that reveals more about its unusual characters than about its usual subjects. The author, a Saudi woman raised up in a gated American community inside Aramco’s Dhahran, in Saudi Arabia’s eastern provinces, from one of the first Arab families allowed to live in the compound, recounts with vividness – and sometimes emotion – a journey of five decades between Dhahran, Beirut, Abu Dhabi and Vienna but specially Beirut. Written over the course of seven years and published in the late 2000’s it is specially revealing in its precocity. Even for the most experienced observers of the Middle East of uprisings and revolutions, it is nothing short of uncanny to read into the thoughts of a Hejazi woman back in the 50’s and 60’s, seeing reflected in them battles that are still our own and that also portray the deep ambivalence of the educated classes towards the relationship of the region to the Western world: “Our father wanted us educated but unaltered, an impossible task”. The early history of Aramco and how deals were brokered between the Americans and the Saudi royalty in detriment of the natives, surfaces clearly with richness of details usually unavailable to historians, mentioning the expertise on beatings of the Saudis since time immemorial coupled with the proverbial indifference of the corporate establishment towards a region rich not only in oil but in illiteracy and backwardness. She recalls the words of her husband at the onset of the Civil War: “Unless we agree to carry arms, we do not belong here. Rivers of blood are going to gush across this country, and soon” and from there begins a passionate and at times irreverent storytelling about the fate of Lebanon during the worst years of the war, living in and out, between Beirut, Abu Dhabi – whose early beginnings are beautifully chronicled in the book – and Vienna. Memoirs of the civil war – particularly written by women – are not rare, and passionate accounts have found their way into books such as Lina Tabbara’s “Surviving the Siege of Beirut: A Personal Account” (1983), Jean Makdisi’s “Beirut Fragments: A War Memoir” (1990) and Soha Beshara’s “Resistance: My Life for Lebanon” (2003); so extensive is the corpus of this kind of chronicling that Miriam Cooke’s book “War’s Other Voices: Women Writers on the Lebanese Civil War” (1996) is entirely devoted to it. There are many aspects however that distinguish Basrawi’s writing: The fact that she was not an active participant in the ideological and political conflicts and also that she experienced a great part of the war in Lebanon rather than exile, added to the fact that her chronicling does not end with the Civil War but stretches all the way to the summer of 2006 when the July War between Hezbollah and Israel ends. Her account of the war mixes personal recollections with facts: “That day, September 17, 1975, when blood, gore, and gold bullions mixed with twisted ideology, organized crime and just plain stupidity, was the day that Beirut died.” This doesn’t keep her story from being highly subjective, for she was not only an onlooker but also a wife and a mother in the highly polarized Lebanese context and the book obviously reflects that. Halldor Laxness instructs in one of his novels that “The closer you try to approach the facts through history, the deeper you sink into fiction.” Had the history been told through the eyes of a Christian, for example, the events and victims would have been portrayed differently. It is for example slightly awkward that although the recollection of events in recent Lebanese history is very detailed, there is not one single mention of the Cedar Revolution. She also expresses the degree to which the book relates to current Saudi politics: “It’s pure politics, actually, my book.” What truly highlights Eduard Said’s insight that literature is of the highest relevance when attempting to understand Imperialism and Totalitarianism. Basrawi sends also a message of encouragement to all Arab and Saudi women, and is straightforward when asked about the Arab revolutions: “It’s the only way to go”.